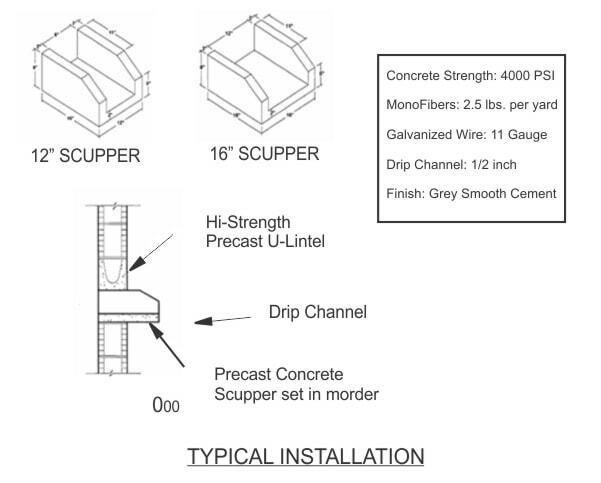 Atlantic Coast Precast in your choice for providing projects in Dania with precast concrete scuppers that are designed to mange the flow of rainwater from gutters and downspouts, directing the flow away from your building foundation. By redistributing, you are able to prevent costly foundation damage and soil erosion. Our reasonable rates, flawless workmanship and long lasting results has customers coming to us for their precast concrete since 1965. Using top quality molds and reinforcing additive in our concrete, our Dania Precast Concrete Scuppers are suitable for use on both new construction and renovation applications. In business since 1965, we have worked with architects, engineers, designers, and contractors to realize their drawings and specifications for precast concrete products. With a variety of sizes and customization options available, protect your building from water damage. Choose from one of our large or small blocks or our team can customize a scupper for your project. The process begins with a cast of your design, which can be altered to allow the size of your scupper to adapt to changes in the building design. Our professional staff is ready to assist you with any questions that you may have regarding Dania Precast Concrete Scuppers. An investment in adding scuppers can help to protect your building from costly repairs later.